Salvation And Survival: "It Is Finished!" These are the last recorded words of Jesus as He died on the Cross. They only appear in the Gospel of John, yet any Christian who is well-schooled in the Bible is familiar with these poignant words. But do we, as the Body of Christ, know what Jesus was referring to? In other words, as my husband has been asking of our Christian brethren lately, What does "IT" mean? What is the "IT" that Jesus has finished? And what does it have to do with us? I have seen very intelligent and knowledgable sources say that the word "finished" comes from the Greek word tetelestai, an accounting term that means “paid in full.” They will explain that when Jesus uttered those words, He was declaring the "IT" to be the debt owed to His Father, which He wiped away completely and forever. Not that Jesus wiped away any debt that He owed to the Father; rather, Jesus eliminated the debt owed by mankind—the debt of sin. As I am progressing through an in-depth study of my Bible, I came across a verse in John that didn't stick out to me the first couple of times I made my way through Scripture. It happens in John, Chapter 5, when Jesus is bearing witness that everything John the Baptist said about Him is true. But then He says, in verse 36, But the testimony which I have is far greater than the testimony of John; for the works that the Father has given Me to finish—the very same works [that is, the miracles and proofs of My deity] that I am [now] doing—testify about Me, [by providing evidence] that the Father has sent Me. It is clear to me that Jesus is saying, "The Father has given me works to do and finish. These works testify that I have been sent by the Father". In other words, all the works He was doing -- healing the sick, casting out demons, raising the dead, and announcing that the Kingdom of Heaven had invaded earth in the person of Him -- have the ultimate purpose of glorifying the Father; the works of Jesus are proof that the Father sent Him. And so, here's where I disagree with the accepted version of what Jesus meant when He said It is finished. True, the Greek word for "finished" can mean a levy or toll that is paid in full. But, according to Strong's Concordance, that is the secondary meaning of the word. The primary definition of the root word, tello, is "an end of a defined purpose; the conclusion of an ultimate or prophetic act". 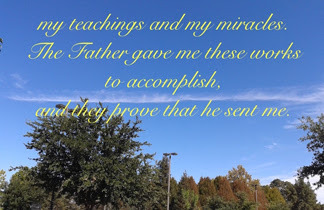 Jesus says in John 5:36 that the Father has given Him works to finish, and that those works revolve around the miracles and proofs of His deity, which will ultimately result in the glorification of the Father. So, when He says It is finished with His dying breath, I contend that He is saying "I have finished all the works You assigned Me to do to bring Your Kingdom to Earth and to glorify You, Father". Jesus says in verse 36 that these works are the greater testimony about Who He is, and Why He came. The reason I think the modern Church doesn't see this is because it would require that we acknowledge not only the significance of "the works" He did, but that He wants us to continue those works. That's why, within the same Gospel of John, Jesus is recorded as saying, Verily, verily, I say unto you, He that believeth on me, the works that I do shall he do also; and greater works than these shall he do; because I go unto my Father. I contend that Jesus was finished with the works the Father had assigned to Him. He had displayed His Deity through the works of signs and wonders, [healing and deliverance], and then given all who believe on Him the authority to continue those works [in John 14:12]. Furthermore, in both Matthew 28 and Mark 16, Jesus emphasizes that He wants believers to be taught to do all that He has commanded; and as they do the works He has done, it will be a sign to others to believe that the Father sent Him and that He is working through them. But the modern Church is uncomfortable when it comes to us performing supernatural acts of healing and deliverance, which are the works Jesus did. It is more logical to the human mind to think that It is finished is simply referring to what Jesus did for us [in paying our "sin debt"], rather than to accept that He had finished His assignment of "works" for the Kingdom, and the mantle has been handed to us to continue them. Can you see that the former explanation puts the responsibility on Jesus, while the latter interpretation makes us accountable for continuing His work? If the "IT" is simply a paid debt, it makes it easier to live the Christian life when you think that Jesus has done the work for you, rather than realizing that we are supposed to carry on the works [that glorify the Father], in His stead. And this results in a Body of Christ that is stagnant and powerless to battle the schemes of the Adversary. Think how much leeway we have given the devil when we only consider that the debt for our sin has been paid. Don't get me wrong -- what a glorious gift of Grace that is! But when you consider that there are so many people who need physical healing and demonic oppression eliminated from their lives, then the "IT" Jesus left us to do has been far from finished in our lives. There have been so few of us who recognize our charge from the Lord, that the "IT" has barely even begun! Yes, Jesus finished His part. He did exactly what the Father commanded Him to do. But a huge part of His assignment was to model for us the work that the Father wants us to continue until Jesus returns. As He hung in agony on the Cross, Jesus was declaring to the Father that He had ushered in the Kingdom on earth, and He had left the Father's work to be continued by those who believe in Him. That stage of the Father's plan was surely finished. It's time we make up for all the lost opportunities to show His glory and the manifestation of His Kingdom here on the earth. Our part of the Father's plan won't be finished until the last person accepts Christ as His Savior. Until then, we need to use every tool He left us to accomplish that goal, and that includes the supernatural works that He did. By neglecting them, we are not being obedient to all that He commanded us to do. I'm not finished; are you? Matthew 5:16 "Let your light shine before men in such a way that they may see your good works, and glorify your Father who is in heaven". You are too kind! I will let the Lord determine the extent of my inheritance.... I just want Him to find me obedient. Interesting .... you have great insight. I can see your point clearly and have often been disappointed to see " Christians " abdicate their responsibility for ACTING on the power given to them through Christ. Let us be more bold in demonstrating that our belief is REAL. Yes, it makes me sad to see the moral shape our country is in, and I believe it is because we are not carrying out our responsibilities as sons and daughters of the King. We are not put here on earth to only receive the entitlements that come from Jesus's sacrifice, but we are to carry on His work and glorify the Father here on earth as He is in Heaven. The truth is, we don't really know who we are. This is probably one of my favorite blogs ever, this topic is one that I have often wondered about. In fact, it is probably what set me out amongst my "church" at a very young age. I have always had the belief about it that you pointed out, I just never quite understood what it was that I was supposed to do about it. The "church" couldn't explain it in a way I could understand. My biggest fear in life is to die with MY journey not being finished. I want to help as many people with Him working through me as I possibly can. I never want to get too tired or too complacent to reach out and touch someone. I am learning more and more that if you trust in Him and follow your gut He will align you to be of service to someone, and that someone is probably not someone that you would expect to help. All those people that you reach out and touch contribute to what I am hoping will one day be a feeling that MY personal journey with God here on earth is finished(I doubt I will ever feel like I have done enough, but I hope to help all the people God sets in my path). I hope that makes sense, this topic of being finished is one that is on my mind a lot lately. It seems the more Kingdom work you accomplish, the more you see that needs to be done; or maybe as you accomplish more things(with Him working through you of course), you realize how much more you are capable of. Kendra, you have perfectly expressed exactly how I feel, too, about my journey. If you truly desire to serve your fellow man, and ask for the opportunities, God will honor your free will choice. Such is what has happened to me and Mark over the last few days. Read the blog post tomorrow and I will explain more. But you are definitely on the right path ... I have been witness to that.